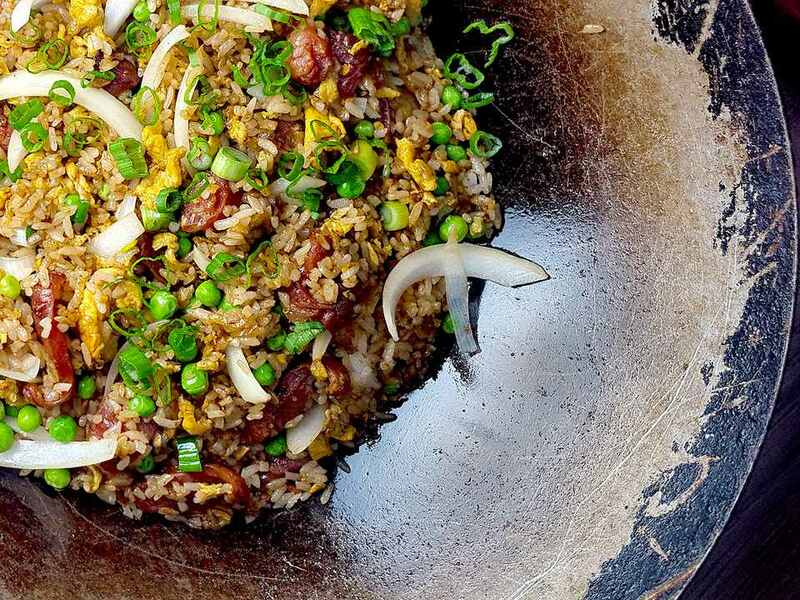 Chinese sausage adds its distinctive flavor to this homecooked fried rice recipe. Beat the eggs in a small bowl with the salt and pepper. Heat a wok or frying pan and add 2 tablespoons oil. When the oil is hot, add the eggs. Cook, stirring, on medium heat, until they are lightly scrambled but not too dry. Remove the eggs and clean out the pan. Heat 1 tablespoon oil in the pan or wok. When the oil is hot, add the minced ginger. Stir-fry for a few seconds, then add the Chinese sausage. Stir-fry the sausage for a minute, then add the shredded carrot and the green peas. Stir-fry for up to 2 more minutes and remove from the pan. Clean out the pan. Heat 2 tablespoons oil in the wok. Reduce the heat to medium and add the rice, stirring with chopsticks to break up any clumps. Stir in the remainder of the soy sauce and oyster sauce. Season with salt and pepper if desired. Add the sausage and vegetables back into the pan. Stir in the scrambled egg. Heat through and stir in the green onion if using. Serve hot.